Thanksgiving 2018 — knead. bake. cook. Oof… Is Thanksgiving old news by now? Very behind on this recap as I decided it was high time to update my portfolio along with working on some other projects. It is amazing to think that it’s been almost 4 years since I’ve been out of college and to see how my work/style has improved and changed over time. What hasn’t changed is my love for Thanksgiving and the particular foods that I always bring. My favorite part of this year’s Thanksgiving was the beautiful drive down to the Bay Area. After two weeks of smoke-filled skies, it was breathtaking to see blue sky and clouds for what seemed like the first time in forever. Even though the trees had been turning color for some time, it was hard to see their true beauty before. They seemed even more saturated than normal on that particular day and I couldn’t help but marvel at them on the whole drive. I always like to eat outside so I was thankful that the rain had cleared out the air. With family members spending time with their other families, this year was a light year which means about 25 people versus the sometimes up to 40 people. 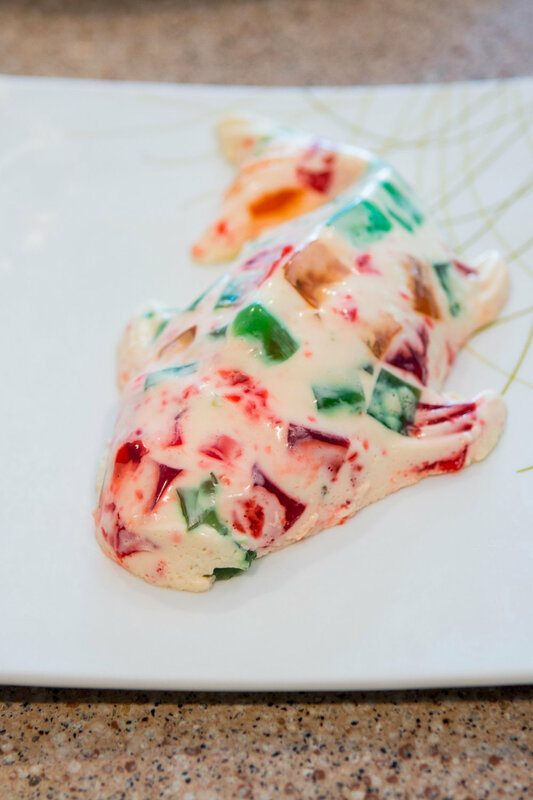 But that made it nice, allowing for more conversation and stories about crazy/hilarious family history along with many lols about this silly jello fish. I did try out my frozen Pumpkin Cinnamon Bread which did turn out alright despite thinking that the dough hadn’t originally risen. I think it requires more science because that initial very slow rise (which I originally thought was a failure to rise) may have been more of an issue than freezing the bread itself. In the end, I did appreciate not having to wake up at a ridiculous hour the morning before (which my mom says is cheating!). Instead, I stuck my already made frozen pie in the oven and that was it for Thanksgiving day. Now for the semi-calm before the next holiday where I need to get back up to speed with holiday baking. I’m starting to think about toffee, cookies, Swedish nuts, festive breads and maybe I’ll try to make a prime rib again between Christmas and New Year’s. Surprisingly, I haven’t been into much Christmas music yet this year except for Band Aid’s Do They Know It’s Christmas and Coldplay’s Christmas Lights. I’m sure that will change soon! Yes, party day is the best day! Graphic designer by day, food blogger and photographer by night and the weekends.